Darragh McKeon’s debut novel, as both an account of the Chernobyl disaster’s human toll and a portrait of Soviet Russia’s collapse, concerns itself with decay. As the familiar falls away, what’s concealed beneath is difficult to confront. His aunt, Maria, was once a writer who clandestinely circulated news of Poland’s Solidarity movement; revealed as a dissident, she now works at a factory, making car parts and wondering if all hope for reform is lost. She is wholly devoted to Yevgeni and loves her sister dearly, though the two struggle with tension stemming from their deceased father’s awful past. 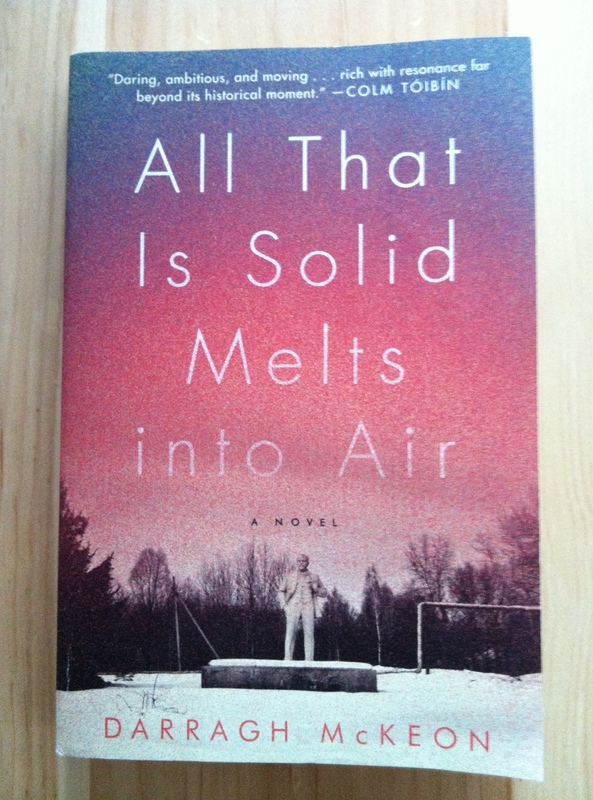 Maria’s estranged husband, Grigory, is one of Moscow’s most promising surgeons when he’s called away on an urgent — and secret — matter: to advise the Soviet officials presiding over the Chernobyl disaster. Outraged by the combination of blindness and cowardice he finds, Grigory attempts to protect refugees and residents of areas near the accident site, only to find himself swiftly deprived of authority. Instead of returning to Moscow, he stays in the displacement camps, operating on children who’ve suddenly developed thyroid cancer and witnessing firsthand the devastation radiation inflicts on the human body. One of Grigory’s patients is Artyom, a teenage peasant who’s the first in his village to notice that something is terribly wrong: the cows are bleeding from their ears. It’s only the beginning of a hellish journey for Artyom, his parents, and his sister. Betrayed by the Soviet system, counted as expendables, the family is one of thousands who lose everything. Artyom is the only major character in the story who seems to fade from view — just like the people whose stories his is drawn from. Mr. McKeon’s prose is careful, eschewing the sensational in favor of measured, occasionally lyrical depictions of everyday life in Moscow and Artyom’s village near the Chernobyl plant. The plight of people affected by the disaster, crushed under weight of Soviet indifference and forced invisibility runs parallel to the plight of ordinary citizens of Moscow, miles away, just as crushed by a system that breathes fear and breeds violence. Only three years from the fall of the Berlin Wall, even would-be dissidents are more than cautious. Maria tells a friend, “Sometimes I hear these words, ‘glasnost,’ ‘perestroika,’ and they sound to me like the final breaths of an empire” — only to hear her friend remind her of dashed hopes thirty years before: “So we went back to doing what we do so well: watching, deluding ourselves with fragile hopes, with an occasional moment of grace or luck; holding on to these things as omens. Hoping ourselves into inaction. Perhaps in a year we’ll be shot for daring to tell a stupid chicken-farmer joke” (255). During these nights, he gazes at them in their cots. Nothing so unimaginable that it cannot be true, this is what he things, beauty and ugliness resting within the single body of a diseased infant, the two faces of nature brought into stark relief. Decay is inevitable, surely. All That is Solid Melts into Air offers the consolations of memory and witness. * I received a review copy of this book from the publisher in exchange for an honest review. I loved how quiet and measured this book was while set in such a chaotic time period. I’ve been recommending it left and right since I read it and hope it continues to get more attention – it totally deserves it. This sounds both good and horrifying at the same time. The title makes me imagine people’s skin melting off them (once I knew what the book was about). It sounds like one we should be reading, though. Does it offer any hope? I love the quotes! The title’s taken from The Communist Manifesto, actually. I suppose it offers some hope, but grounded in realism: what’s done is done. This sounds very interesting. I have long had an interest in Russia. My husband does also, so I’m going to forward him your review. Wonderful! Has he read A Constellation of Vital Phenomena? No, I haven’t either. I’ve been eyeing it, though. I guess I need to get it! I’ve been very curious about this one. It sounds good!